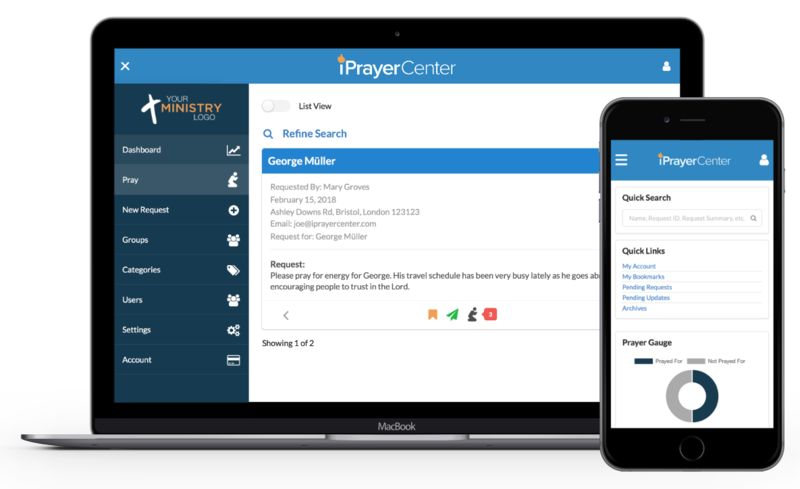 The iPrayerCenter is a full-featured prayer request management system that will give your ministry the ability to collect prayer requests right from your own web site. The iPrayerCenter is an API driven, mobile-first web application that will allow your intercessors to pray anywhere, anytime, on any device. Our desire is to increase your prayer ministry by providing custom software that is affordable and easy to use. Users are typically one Super Administrator (Account Owner), a few Administrators, and many Intercessors. Easy integration by copying and pasting the provided prayer request form widget into your website. All requests are moderated by administrators. Once the request is moderated it becomes visible to your prayer team. The intercessors pray for requests and send optional PrayerGrams (notes of encouragement). All activities are logged and used for our sorting algorityms so that no request gets lost in the shuffle. Optional Automated Followup Cycle to make management of your requests a breeze. Turn on AFC and the iPrayerCenter will automatically send out update requests. We provide a custom editable dashboard to support communication with your Intercessors. Some ministries use the dashboard to communicate a prayer theme for the month while others use the dashboard as a training guide. It's totally up to you. Connect to your iPrayerCenter where ever you go with any computer or mobile device. All you need is internet access. After you complete the sign-up process for the free trial, your iPrayerCenter will be automatically created, and you will receive a confirmation email to complete the signup process. Thank you! We pray that this tool will be a blessing to your ministry. © 2019 iPrayerCenter All Rights Reserved.